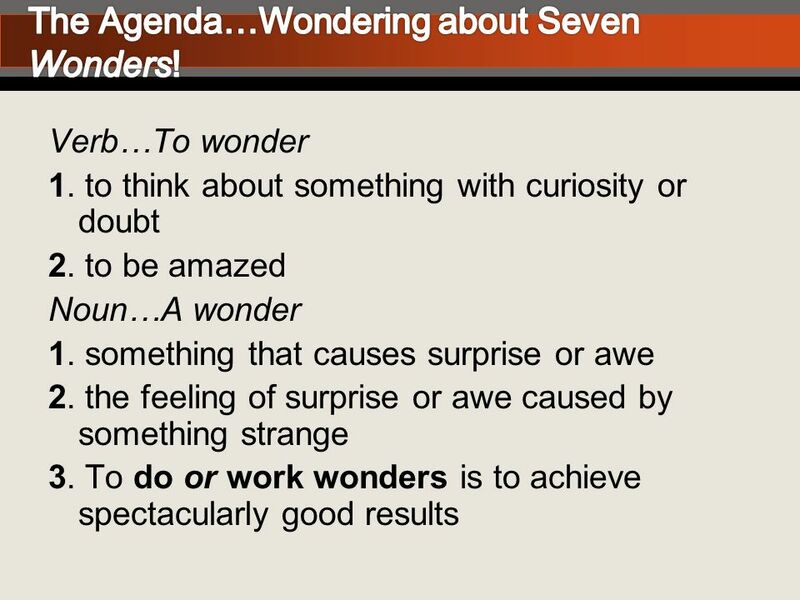 5 Leadership is about going somewherepersonally and in concert with others in an organization. Although leadership, especially position (elected or appointed) leadership, is often discussed in terms of leader qualities and skills, the matter of leadership as a responsibility of each professional receives little attention (Wheatley, 2005). 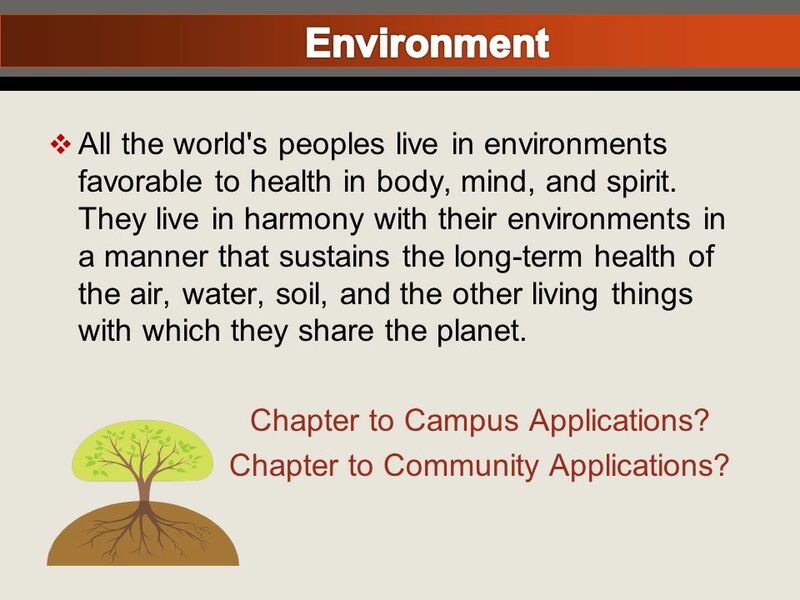 The campus and larger community can benefit from the leadership of chapter members in addressing issues related to social responsibility in the areas of peace and security, social justice, environment, prosperity, innovation/technology, health and education. Program objectives include the following: 1.Promote, encourage, and strengthen leadership development at all levels of the campus community in regard to social responsibility. 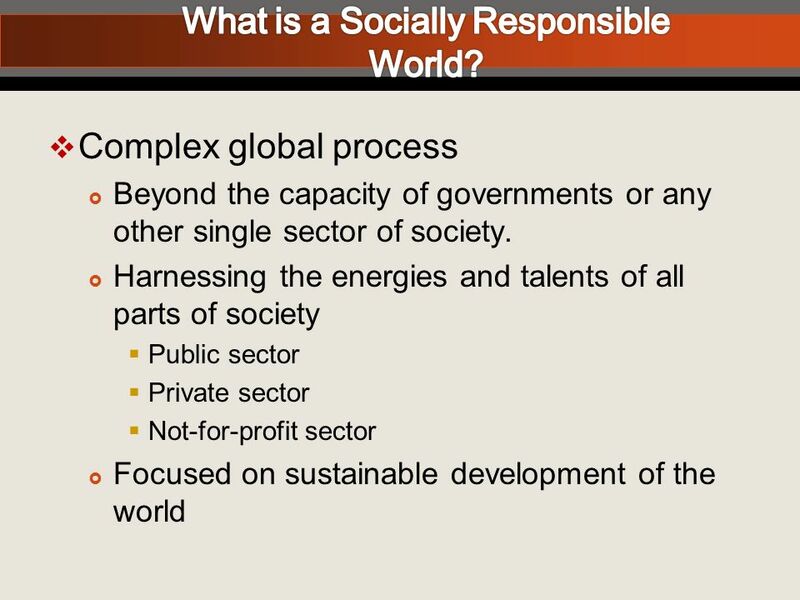 2.Engage in a dialogue among student groups regarding social responsibility. 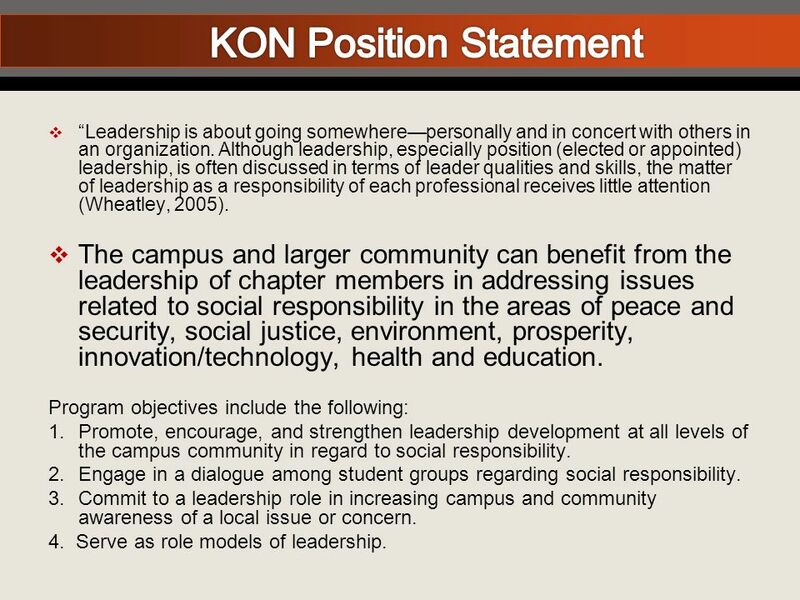 3.Commit to a leadership role in increasing campus and community awareness of a local issue or concern. 4. Serve as role models of leadership. 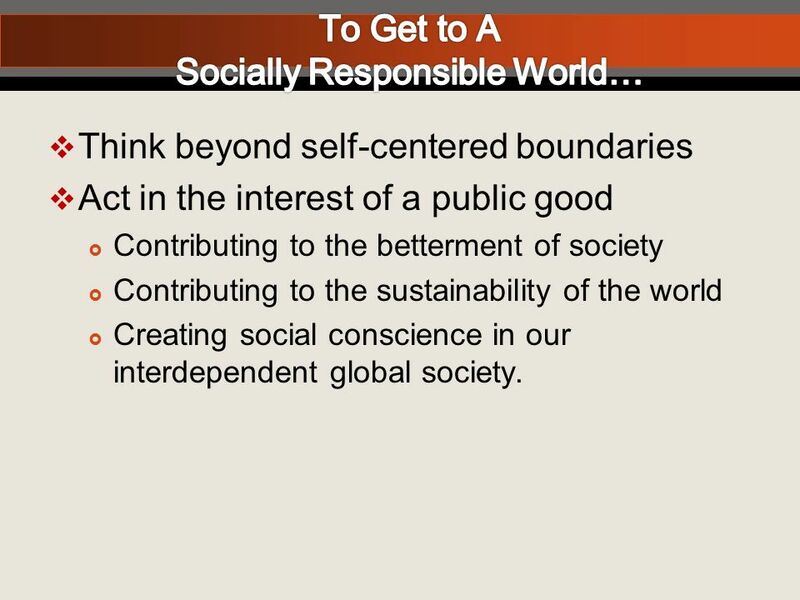 6 Think beyond self-centered boundaries Act in the interest of a public good Contributing to the betterment of society Contributing to the sustainability of the world Creating social conscience in our interdependent global society. 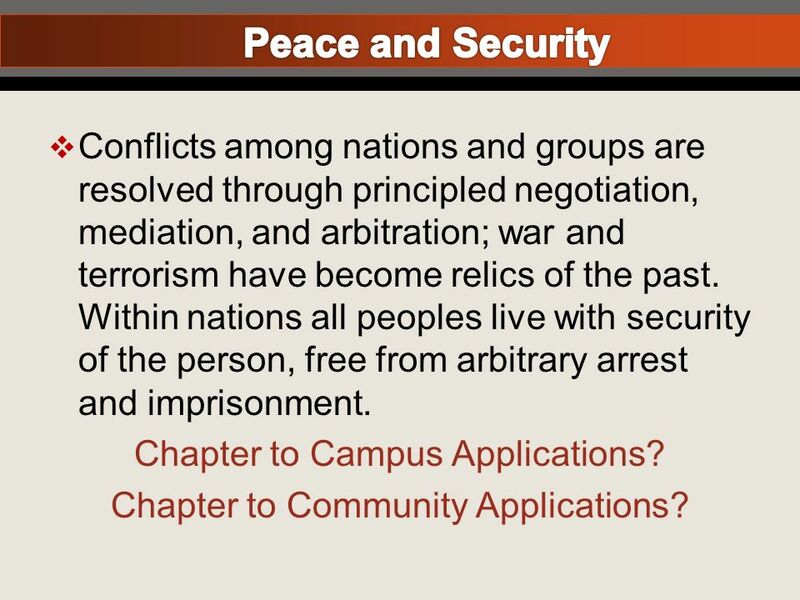 8 Conflicts among nations and groups are resolved through principled negotiation, mediation, and arbitration; war and terrorism have become relics of the past. Within nations all peoples live with security of the person, free from arbitrary arrest and imprisonment. Chapter to Campus Applications? Chapter to Community Applications? 9 All the world's peoples are literate in their native language and have access to education, which will enable them to reach their potential. Chapter to Campus Applications? Chapter to Community Applications? 10 All the world's peoples live in environments favorable to health in body, mind, and spirit. They live in harmony with their environments in a manner that sustains the long-term health of the air, water, soil, and the other living things with which they share the planet. Chapter to Campus Applications? Chapter to Community Applications? 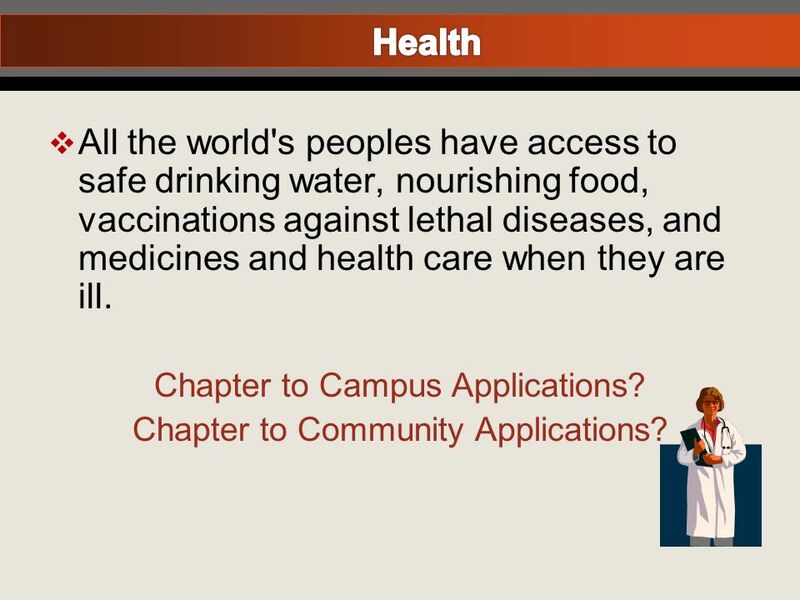 11 All the world's peoples have access to safe drinking water, nourishing food, vaccinations against lethal diseases, and medicines and health care when they are ill. Chapter to Campus Applications? Chapter to Community Applications? 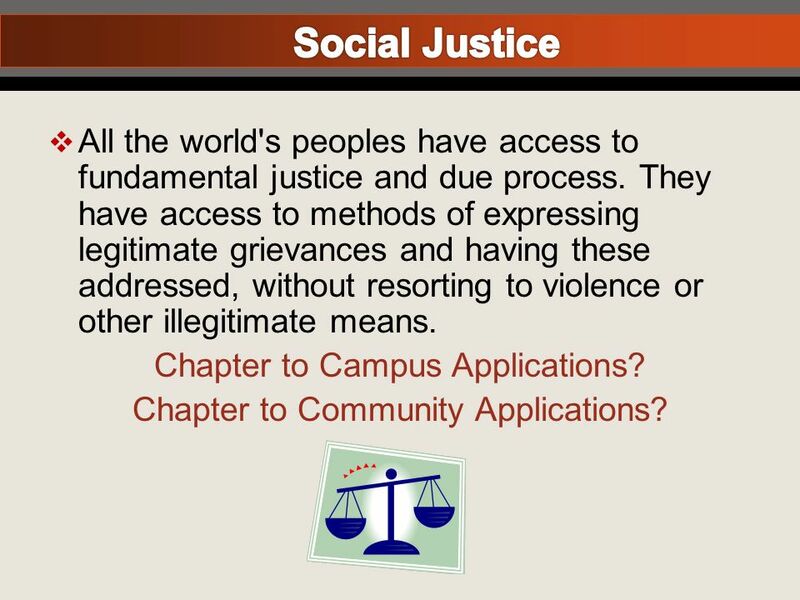 12 All the world's peoples have access to fundamental justice and due process. They have access to methods of expressing legitimate grievances and having these addressed, without resorting to violence or other illegitimate means. Chapter to Campus Applications? Chapter to Community Applications? 13 All the world's peoples have incomes adequate to meet their needs for food, clothing, and shelter. 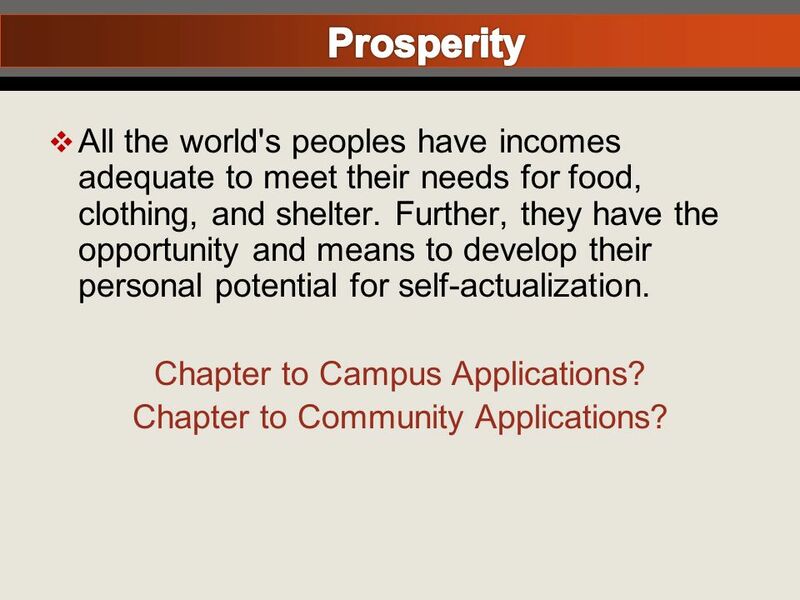 Further, they have the opportunity and means to develop their personal potential for self-actualization. Chapter to Campus Applications? Chapter to Community Applications? 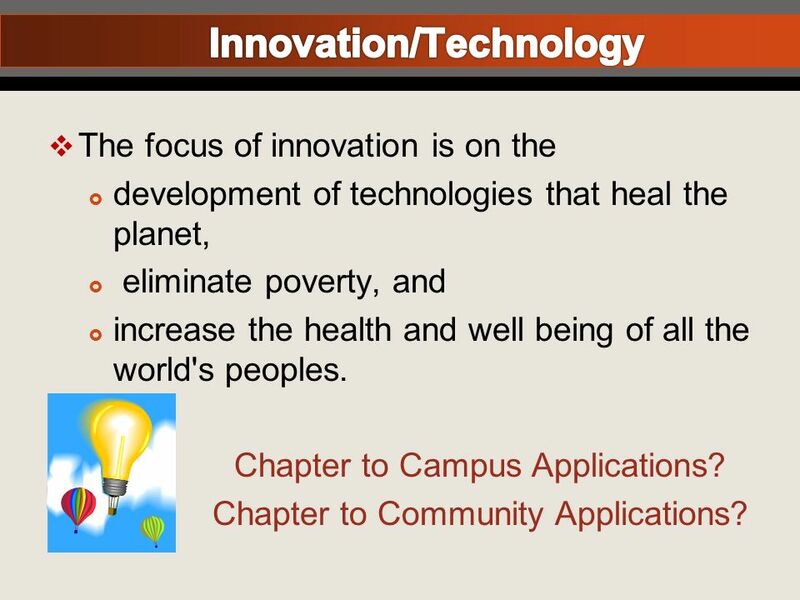 14 The focus of innovation is on the development of technologies that heal the planet, eliminate poverty, and increase the health and well being of all the world's peoples. Chapter to Campus Applications? Chapter to Community Applications? 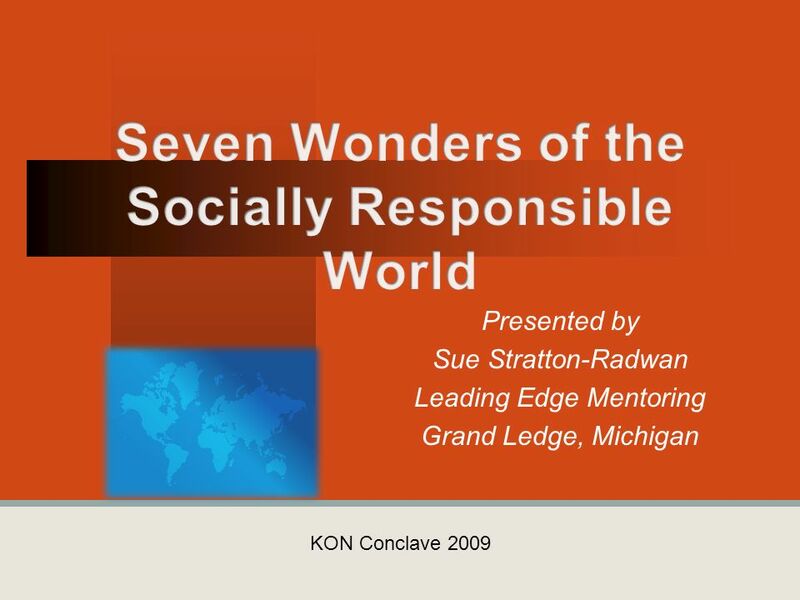 Download ppt "Presented by Sue Stratton-Radwan Leading Edge Mentoring Grand Ledge, Michigan KON Conclave 2009." What Works in Youth Engagement? 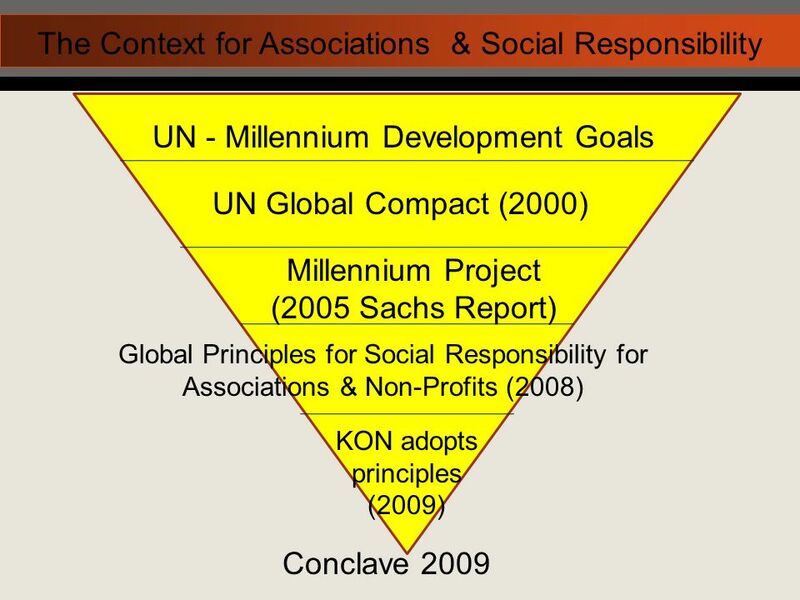 Organizational goals Expand network of people engaged Focus and specialized expertise Reduced administrative overhead Adopt emerging communications technologies. Professor Hai-Sui Yu, FREng Pro-Vice-Chancellor (International) Welcome Event for New Staff March 2013.  Further open trade & finance systems that are rule- based, predictable & non-discriminatory, w/ commitment to good governance, development, & poverty. Our Mission The Bucks County Women’s Advocacy Coalition is a non-partisan coalition of Bucks County individuals and the non- profit organizations that. 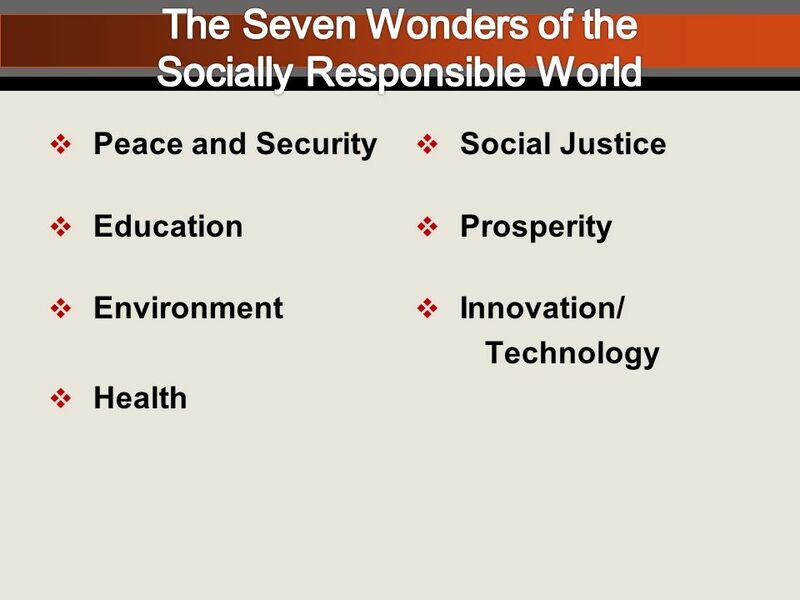 Grand Challenges for the Profession of Social Work Local Effort by the University of Southern California School of Social Work. Building Community Capital Dr Trevor Hancock Health Promotion Consultant Victoria BC, Canada. Discussion on the relationship between research and practice in Social Responsibility. The Science Council and Sustainability. 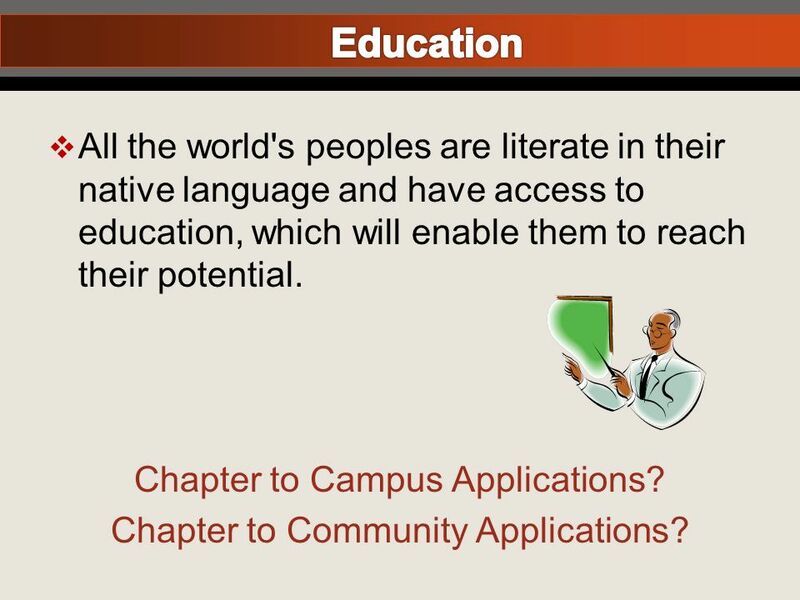 What is global education? Underlying the objectives of global education is the belief that education can provide learning experiences which will raise. Creating and Sustaining Healthy Organizations February 25, 2013 Larry D. Roper.